February | 2010 | Ethel. Today, I have discussed stress more than I normally care to. From consoling friends to helping my boyfriend, I was talking about it so much, I started to think of chandeliers. The chandelier is a carefully balanced piece of art. Each arm that extends dutifully from the center holds gems of varying size, color and weight. The chandelier is the tight rope of home decorating: one minor flaw, and the whole thing can come crashing down. Life is the same way. If you don’t have everything in balance, or if the balance shifts a little, everything gets thrown off. And if you get overloaded, the whole mess just falls apart. Tulips on the other hand … I would love to be a tulip. Carefree, sitting in the sun all day, basking in the rain. 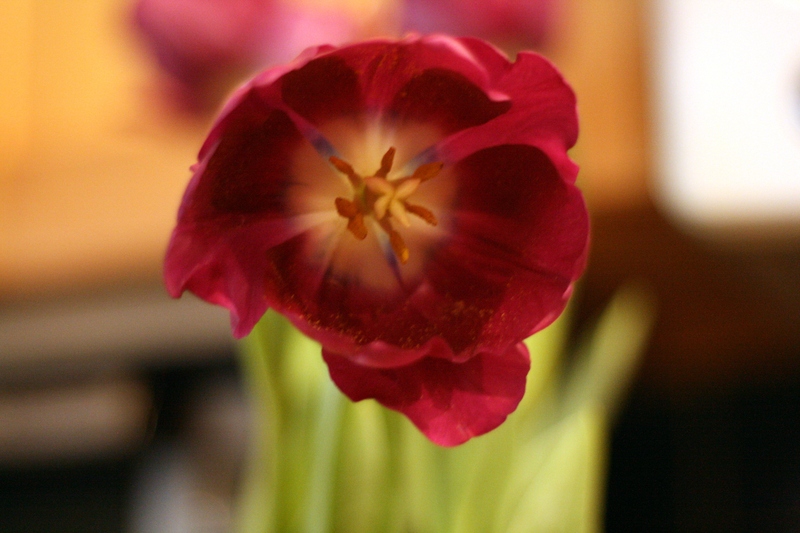 Tulips have no obligation to the world other than the elegant display of their beauty. One of the beautiful tulips my boyfriend bought me today.